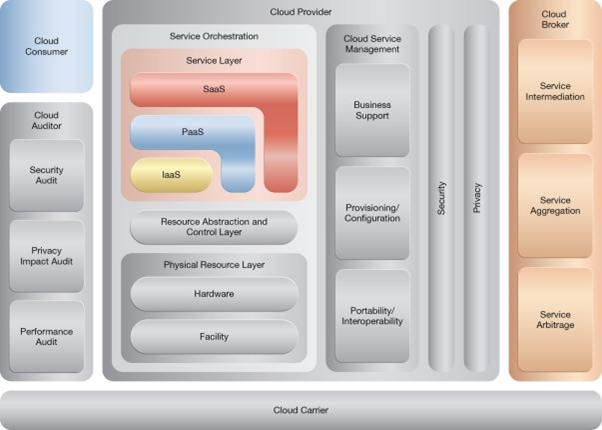 How can cloud services be made accessible to a diverse range of cloud service consumers? Cloud consumers may require access to a cloud service via cloud service consumer devices, protocols or data formats that the cloud service is not designed to support. Runtime mapping logic is incorporated to transform data exchanges between the cloud service and different cloud service consumers. The mapping logic is added to the cloud service logic or positioned separately, within a multi-device broker mechanism that transforms data exchanged between the cloud service consumer and the cloud service. A cloud service containing runtime mapping logic is implemented (1) and made available to different kinds of cloud service consumer devices (2). 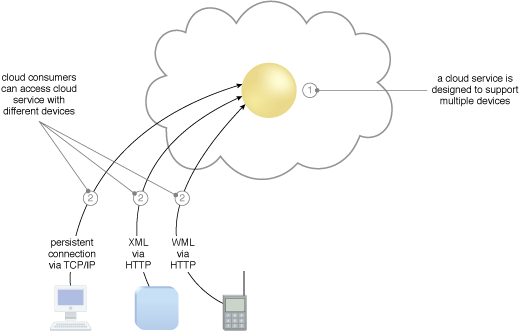 The cloud consumer (top) accesses and configures a physical server using a standard device and protocol that is now supported as a result of applying the Broad Access pattern. The cloud consumer (bottom) later accesses the cloud environment again to install a virtual server on the same physical server, and deploys an operating system and a database server. Both actions represent management tasks that can be accomplished via different devices brokered by the same centralized multi-device broker mechanism.